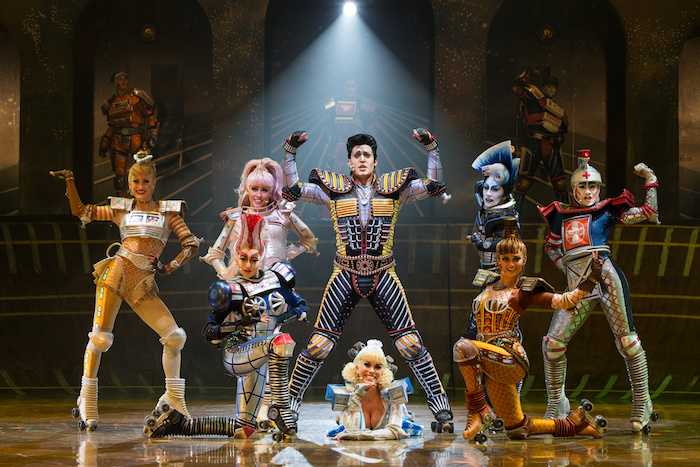 Bochum Theatre's Starlight Express is to be performed in English for the first time ever in a one-off show. Andrew Lloyd Webber's musical is about a child's train set that comes to life and competes to become the fastest engine in the world. It opened at the Apollo Victoria Theatre in 1984, and closed in 2002. The actors famously perform on rollerskates, and the original choreography was by Arlene Phillips. It has been running in Bochum, Germany for almost 29 years, and has been seen by more than 16 million people. The German production has the original West End staging, which sees the characters skating through the stalls and audience. This production will now be adapted into the English language for the first time on 28 March 2017. During its run in Bochum, producers made revisions to the production, adding songs such as "Crazy" and "Allein im Licht der Sterne" ("Next time you fall in love"). Some of these songs and other scenes have had to be translated as they have not been performed in English. Producers have also recorded an English child's voice as the Control Voice. Artistic director Steven Rosso said: "Our many English-speaking performers are really looking forward to finally being able to perform a show in their native language!" The musical has music by Lloyd Webber and lyrics by Richard Stilgoe. The new cast for 2017/2018 includes Michael Pickering as Rusty, Carla Pullen as Pearl, Richard Woodford as Electra, Ben Carruthers as Greaseball, Reginald Jennings as Papa, Abigail Never as Dinah, Serina Mathew as Buffy, Sian Velazquez as Ashley, Daniel Ellison as Caboose, Gavin Ashberry as Dustin, James Marshall as Flat Top, Cyrus Brandon as Hip Hopper 1, Garry Kessing as Hip Hopper 2, Dennis Spee as Hip Hopper 3, Dawn Leigh Woods as Volta, Hannah Kiss as Wrench, Lucy Glover as Joule, Christopher Haley as Krupp, Anthony Starr as Purse. Engines will be Daniel Holley, Dariuc James, PaddyJoe Martin, Dan Partridge, Karl Seal. Alexander Deutshmann, Manuel Reckow and Etienne Vogel feature as Trax. Swings include Gemma Archer, Zoe Hershaw, Lacy Jordinson, Danielle Lockwood, Rose Oulette, Cary Chennell, Brad Corden, Ben Draper, Will Luckett, Marc McFadyen, Andrew Millar, Corey Mitchell, Tom Nihill, Oliver Roll, Stuart Rouse, Gary Sheridan & Paul Shipp.